Despite what is often seen on screens, the world isn’t flat – and neither are people. That’s why three-dimensional imaging is important. The full picture of a volume can provide vital information about a medical condition and the progress of any treatment. Fortunately, advances in 3-D imaging promise to make surgery, research and health screening more effective and efficient. Pictured is better back surgery, thanks to 3-D imaging. Here doctors use an image guidance platform to determine the best placement and size of an upper thoracic pedicle screw in a planned spinal fusion surgery. Image courtesy of the Mayo Clinic. Aching backs could soon get a break, thanks to advances in 3-D imaging that could make the placement of spinal fusion screws more precise and back surgery results better, according to findings from the Mayo Clinic. Spinal fusion surgery relieves back pain by combining two or more vertebrae, sometimes with the help of screws. These screws must be carefully placed, or serious injury can result. In a study, the researchers investigated the success of 3-D image-guided screw placement in 220 consecutive patients who had a total of 1084 screws inserted. The nerve injury rate was less than 1 percent, and the reoperation rate was one out of 220, numbers far better than the several percent that is the norm in both categories for surgery sans image-guiding technology. Nearly all of the screw breaches that did occur with 3-D imaging were minimal. Lastly, the image-guided approach allowed the largest-diameter screw to be used, increasing biomechanical stability and the fusion success rate. “These four points can all be attributed to the accuracy of the system and the ability to place screws using 3-D navigation,” said Eric W. Nottmeier, a neurosurgeon at the Mayo Clinic’s Jacksonville, Fla., campus. He was lead author of a Journal of Neurosurgery: Spine paper on the study. The group used two systems, one from BrainLAB and the other from Medtronic. These work by rotating a fluoroscopy unit around a patient to create a 3-D cone-beam CT data set. The unit’s movement is tracked by a camera following a reflected infrared beam. That provided the data required to locate the patient’s anatomy in space. Reflected infrared also determined where the image-guided instruments were during surgery. A postoperative CT scan shows the placement of upper thoracic pedicle screws as seen from the axial (left), coronal (center) and sagittal (right) views. Image courtesy of the Mayo Clinic. This setup allowed screws to be placed to within a millimeter of their planned location. It also minimized the surgical team’s exposure to ionizing radiation. The technology does have its drawbacks. The systems are expensive and complicated, making mastering them challenging and time-consuming. There also can be problems with the amount of technology bundled together and with the infrared tracking. Nonetheless, the technique could be more widely used in the future. After all, it produces good results. An image-guided approach could have greater appeal to younger surgeons raised with computers and video games. “Its use may become more widespread because of this,” Nottmeier said. Not all 3-D imaging involves people, of course. Animal models are frequently used in preclinical studies evaluating some new treatment. Often what must be imaged and measured in a mouse is the same as in a man, noted Desmond Hirson, vice president of engineering at Toronto-based VisualSonics. That’s one reason why VisualSonics makes some of the highest-resolution ultrasound imaging equipment in the world. A typical commercial ultrasound runs, at most, at a center frequency of 15 MHz. Units from VisualSonics, on the other hand, run at 55 MHz, Hirson said. Because of that higher frequency, the systems have a resolution down to 30 μm, far better than the hundred or so microns typical of a commercial unit. Aside from a higher frequency, Hirson pointed to the latest transducer array, which is electronic and not mechanical, as being a technological differentiator. It allows a higher frame rate and more uniform imaging than were possible before. It also allows color flow imaging. But no matter what the technology, 3-D imaging is limited by the nature of the ultrasound. For example, it has trouble penetrating bone, which makes imaging inside the skull difficult. It also can be difficult to restrict what is being imaged to only objects of interest. Enter photoacoustics, which uses light to generate sound. “The benefit there is that you can be very specific in terms of what you’re observing, due to the wavelength of light,” Hirson said. With photoacoustics, for example, hemoglobin levels in the blood can be highlighted. It also means that the inside of the skull can be visualized. 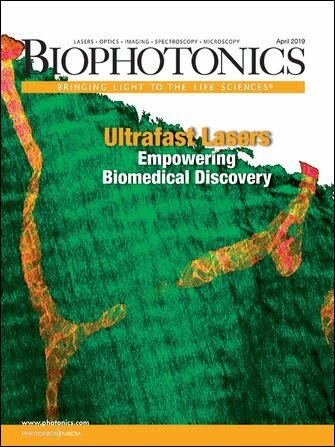 The company has signed a deal with Seno Medical Instruments of San Antonio, which offers photoacoustic small-animal imaging technology (See “Tracking cancer with light and sound” in the September 2008 issue of Biophotonics International). The photoacoustic technology will be integrated into VisualSonics’ products. One possibility is the development of photoacoustic contrast agents that can be used in a preclinical or clinical setting. These agents consist of an antibody or ligand attached to gold nanorods that absorb light and produce a sound, an arrangement that provides some advantages. “The contrast agent can be very specifically targeted to image on the molecular level or detect things on the molecular level,” Hirson said. A final example of 3-D imaging can be found in a new technology being developed by GE Healthcare of Chalfont St. Giles, UK. David Caumartin, the company’s manager of global mammography, noted that the standard full-field 2-D digital mammography misses some cancers. It also forces some patients to undergo recall or biopsy because of suspicious images, which may turn out either not to be necessary or not to be cancer. The new technology could reduce both problems. “What 3-D imaging could bring in screening is to improve the efficiency,” Caumartin said. The system uses a fixed detector, with multiple low-dose exposures of the breast under compression taken at different angles. The data is then reconstructed to provide a 3-D image. The challenge is to collect the data while only exposing the patient to the same dose and for the same amount of total time as with 2-D technology. Achieving this means that the dose and exposure time for any given shot are much less than when using the 2-D approach. GE’s detectors, which yield data even at very low doses, have been designed for this situation. Caumartin pointed out that the reconstruction of the image doesn’t involve binning pixels, a process that combines adjacent locations. Binning increases the signal but blurs fine features. In its systems, GE is using its own algorithms. The company currently is finishing the system’s premarket approval study as required by the FDA. Once approved by the FDA, it will be available for sale in the US. Three-dimensional digital breast tomosynthesis imaging promises to detect more cancers and improve screening efficiency. Images courtesy of Drs. Di Maggio and Gennaro, Istituto Oncologico Veneto, IRCCS; Padova, Italy.